Tizagenix the owner of Use-Rainwater brand has been appointed by WISY AG as the official agent for WISY rainwater harvesting equipment in Southern Africa. WISY AG is a leading German manufacturer of all components of a modern rainwater harvesting systems. With over 20 years experience, they manufacture products at their factory in the Hessian Vogelsberg. Wisy has their own development, research and production departments and their products are guaranteed to have a superior quality advantage in durability and reliability. WISY products has successfully been installed across the world in In public buildings such as schools, hospitals, offices and football stadiums. WISY products guarantee reliable rainwater supply to customers. Homeowners and architects appreciate the ease of use, durability and low maintenance of WISY storm-water systems. 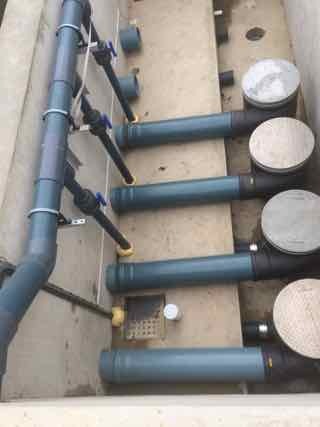 Many of the current Use-Rainwater designs that our company have installed across South Africa incorporate the WISY primary rainwater vortex filters in the installation. These units has proven that they work successfully in South Africa rain conditions. Primary rainwater filters are the heart of any good rainwater system design. These units screen out any debris and prevents it from getting into the rainwater tanks. The Wisy units are self cleaning and and screen out any item larger than 280 - 400 microns. This minimises the buildup of sludge in rainwater tanks and ensure good water quality. Wisy has designed a number of units that can be used for primary rainwater filters. The WFF300 flagship unit is designed to singularly filter water coming off a roof section of 3000 square meters, thus making it ideal for large buildings and factories. Many of these units has been installed across the world in stadiums, factories and public buildings.